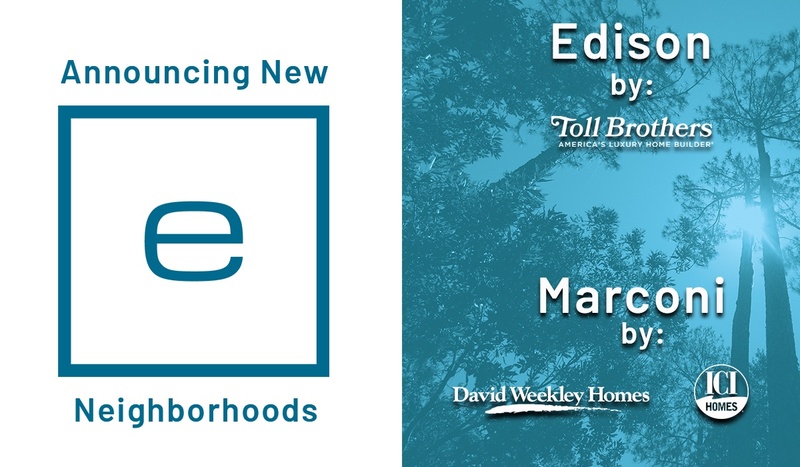 The first two neighborhoods unveiled in eTown include Edison by Toll Brothers, and Marconi by David Weekley Homes and ICI Homes. Both neighborhoods will feature one- and two-story home designs featuring new architecture ranging from approximately 2,500 to over 4,000 square feet. Builders will release floor plans on eTownJax.com and begin selling homes in the coming months, with model homes scheduled to open in summer 2019.
eTown is a new smart living community built around the belief that convenience, community, technology, and sustainability enhance a modern way of life. eTown will facilitate a connected and convenient lifestyle for residents enhanced by thoughtful details rooted in sustainability and state-of-the-art technology. Smart living at eTown will include homes, retail, office, parks, and more. With abundant natural areas, a diverse neighborhood blueprint, and more, there will be many opportunities to connect at eTown. 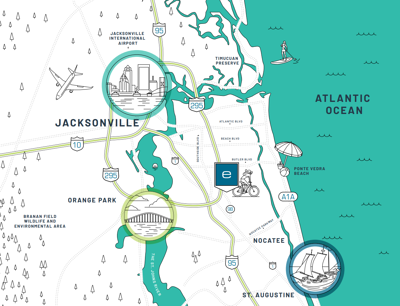 Located off SR9B near I-295 on the southside of Jacksonville, eTown is convenient to the area’s premier dining, shopping, and cultural destinations. However, convenience is more than location. Not only is it centrally located, but the community amenities and design will make it just as easy to never leave. For more information on eTown, visit www.eTownJax.com. Article adapted from original post on www.nocatee.com and www.eTownJax.com. Article adapted from original post on www.etownjax.com.